These are stunning sparkly jackets, in plus sizes 0x to 9x! They run very big, so make sure & check measurements below! They have long sleeves, and run appx 36"-38" long, but are available with different sleeves, or other lengths as a special order. The gray/silver is sheer glimmer lurex type fabric, it does stretch, and is kind of a lightweight sweater knit. 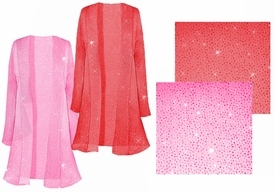 The pink has pink glitter, is a very sheer georgette type fabric, with very little stretch. The red has red glitter and is similar to the pink in both texture and stretch. All 3 of these are washable, and all are made in the USA!